You are currently browsing the category archive for the ‘beggars’ category. I was dismayed to learn recently that Brioni is no longer dressing James Bond in their wonderful suits. It was as my last remaining link to 007. I can hardly lay claim his physique, devastating smile, sophisticated taste or ruthless ability to dispatch enemies. However, I used to be able to say that we occasionally wore the same duds. We were living in an upscale section of Montreal when Brioni came into my life. I had stumbled across a thrift shop where society ladies discarded their cast-offs. There was a small selection of men’s clothing with one very nice suit. At the time, $200 seemed like a lot of money, but I didn’t realize the suit was going for ten cents on the dollar. These days, Brioni suits go for $5,000. Think about that– ten pieces of beautifully- tailored cloth for the price of a brand new Vespa! I wrote a short memoir piece about the suit and this is how I described it. Brown? That will hardly do. It was evocative of summer wheat, shiny acorns, the African savannah, the opalescent patina of a fine violin. The buttons, gold, embossed with the bas relief of a polo player. Made in Italy sewn discreetly in the label. Fine clothes like that can seduce you. They make you feel like you could be Bond, if necessity required it. Most of us are insecure in the knowledge of our roles, and a good suit positively exudes class. My story centered on the one evening when I actually wore the suit during our three years in Florida. Sandra Day O’Connor, the Supreme Court Justice, had come down to open the new law school library at the University. At the cocktail party a high-powered developer, a man whose name I recognized from the local newspaper, singled me out from the crowd and proceeded to assault me with questions. Where was I from? What did I do? etc., etc. Two minutes later he broke away, leaving me with an odd feeling. I had been sized up, found wanting and dumped, and I had no idea why. It was only much later that an explanation came to me. Like a butterfly to a beautiful flower, he had come because of the suit. He was probably the only man in the room who realized I was wearing a very expensive outfit. He simply couldn’t figure out what someone with no visible means of support was doing in it. It was a Fellini moment, my very own 8 and 1/2. The Christmas season seems to bring out the beggars here. The sight of them is disconcerting if you have recently come from Australia. 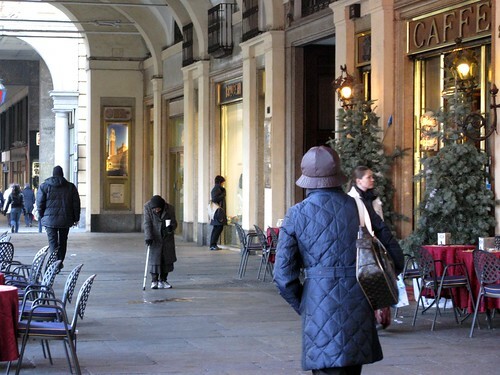 In Melbourne one gets used to panhandlers, but one never sees people in abject positions like the ones you see in Italy, with bowed heads or knees on the sidewalk. Most of them have signs signaling why the are reduced to asking for coins. Some have children with them and look like gypsies. A handful are dressed entirely in white, with ceramic masks hiding their faces. They look like they have stepped out of the middle ages. A recent comment by a drop in reader has alerted me to the fact that those of you who are following this blog in a less than dedicated fashion (you know who you are), may be under the impression that we have suddenly decamped to Italy. Such is not the case. This is a working holiday (for my wife), a real one for me. We’ll be back in Melbourne in February.